Did you know 50 to 70 million American adults suffer from a sleep disorder of some kind? In fact, one in three report taking sleeping pills each night before bed. You’d think the troubled sleep that plagues our country would have more people searching for natural remedies to sleep rather than reaching for a pill. Turns out a soak in the hot tub might just be the answer. Whether it’s a warm summer night or cold winter afternoon, hot tubs sound good just about any time of the year. We often think of hot tubs as being a place to congregate with family, friends, and neighbors, and it most certainly is. But have you ever considered the health benefits of a soak in the hot tub? Turns out, there are more than a few. 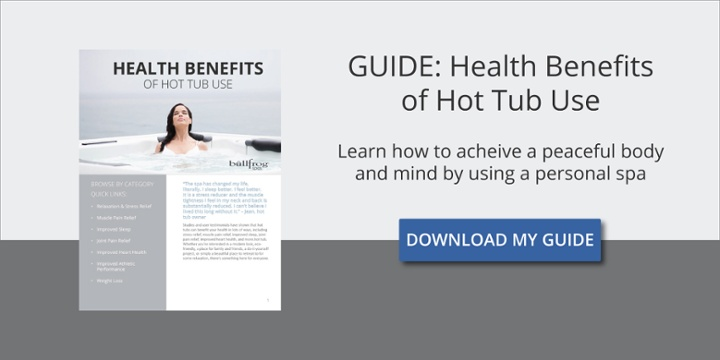 Hot tubbing is a form of hydrotherapy that has been proven to improve overall well-being. Studies show hydrotherapy can improve immunity, blood circulation, anxiety, and pain. It can even improve your sleep. According to the American Sleep Association, one-third of the adult population logs less than seven hours of sleep each night. Often times this is because of poor sleep structure, but several other factors can contribute to sleep loss. Some individuals suffer from sleep deprivation voluntarily. Sounds crazy, right? Who would choose to suffer the consequences of lost sleep? The truth is, we all have. Most of us are unaware of how much sleep we actually need. We choose to stay up late to participate in social events or enjoy hobbies like going to the movies or late-night Netflix binges. We even go so far as to caffeinate ourselves to keep our body awake to socialize with friends late into the night. Other times, environmental factors are to blame for lost sleep. Light, temperature, and noise have a huge impact on our sleep quality. If your sleep space is too bright, too loud, or too hot, your sleep will likely suffer. But then, there are certain situations that lead to sleep loss that are completely out of our control. Maybe you suffer from a sleep disorder, like insomnia. Perhaps, sleep apnea runs in your family and you have fallen victim to this disruptive sleep disorder. Or maybe you are under chronic stress that keeps you up at night. According to theAmerican Sleep Association, 50-70 million Americans have a sleep disorder. Insomnia is the most common sleep disorder, with short-term issues reported by 30% of adults and chronic insomnia reported by 10%. Meanwhile, 25 million U.S. adults suffer from obstructive sleep apnea. If that’s not enough to convince you that sleep deprivation is an epidemic sweeping across America, maybe this will: 7 out of 10 Americans say they experience stress and anxiety daily that interrupts their sleep. It’s no secret that sleep has a drastic impact on overall health and wellness. In fact, sleep is the glue that keeps our mind and body intact. Some consequences of sleep deprivation are immediate, while others are long term. A study done by the Mental Health Foundation found that people that didn’t get enough sleep were four times more likely to suffer from lack of concentration, have relationship problems, and three times more likely to be depressed. If you find yourself in a bad mood, easily irritable, forgetful, or just plain groggy, take that as a warning sign—your body is trying to tell you it needs more sleep. In the long term, a lack of sleep can increase the risk of high blood pressure, immunodeficiency, diabetes, weight gain, and heart disease. In fact, one study found getting less than six hours of sleep on a regular basis increases your chances of dying from heart disease by 48%. Bedtimes aren’t just for kids. Our bodies were designed to sleep and wake at the same time each day, thanks to our body’s internal clock known as our circadian rhythm. Before the invention of artificial light, our bodies went to bed and rose with the sun. Now, it’s our responsibility to signal to our brain it’s time to sleep. And that takes discipline. 2. Create a wind-down routine and stick to it. Did you know our bodies were designed to shut down around the same time each night? That’s because we naturally respond to changes in the light and our energy levels shift according to the differences in light. When it is sunny out, our brain is signaled to suppress the production of melatonin (the hormone that makes us sleepy). However, once the light source goes away, our brains are signaled to start producing the melatonin and prepare for sleep to recharge. With the invention of artificial light and technology, our brain is never signaled to shut down. The light from screens and lamps suppress the production of melatonin. Therefore, it’s our job to signal to our brain when it’s time for sleep. About an hour before bed, dim the lights and stash all screens. Hop in a hot shower, warm bath, or the hot tub. When you get out, the rapid drop in body temperature will help aid in sleep. Bust out some essential oils. Aromatherapy and scents like lavender have been proven to relax you and offer a deeper sleep. Opt for a book if you get tempted to pick up your phone. 3. Turn off your technology. This is so important, it’s worth repeating. The blue light emitted from our technology’s screens stimulates our brains and keeps us up at night. About an hour before bed, put down your phone and pick up a book instead. 4. If you find your mind racing, consider meditation. If you lay in bed restless for longer than 20 minutes, try meditation. Mindful meditation fights insomnia by promoting a relaxation response in the body. If you find yourself tossing and turning try relaxation breathing techniques and light stretching. Make sure you don’t turn on the TV, check your phone, or turn on the lights. When you get sleepy again, go back to bed and try to sleep again. If you try to no avail, get up again after another 20 minutes and do the same thing. According to a study conducted by the NCBI, soaking in warm water during the evening led to an increase in sleepiness at bedtime and deep, slow-wave sleep. Another study conducted at the University of Sao Paulo in Brazil tested the effectiveness of passive body heating (immersion in hot water) for better sleep in women with fibromyalgia. The results indicated that the patients showed a decrease in the time it took for them to fall asleep and that they reached REM sleep (the deepest stage of sleep) more quickly. They also spent less time tossing and turning and woke up fewer times throughout the night. Temperature is one of the number one factors that impact sleep. In order to fall and stay asleep, our core body temperature must drop a few degrees. This happens naturally each night before going to bed. Soaking in a warm hot tub a couple hours before bed will cause your core body temperature to rise and then drop rapidly. This rapid drop in body temperature will help relax you and is said to put you in a deeper sleep. Many consider taking a warm bath before bed a natural remedy to sleep. However, unlike baths, you can hot tub with your friends. If you struggle from lack of sleep as a result of chronic stress, slipping in the hot tub might help ease your anxieties. Anxiety directly affects our sleep quality. When we are under chronic stress, our bodies are unable to relax in order to fall asleep. That’s because our sympathetic nervous system stays in a constant state or fight-or-flight—aka our bodies constantly release neurotransmitters such as adrenaline, dopamine, and noradrenaline, all of which increase alertness (the opposite of what should happen at bedtime). Soaking in the hot tub helps relax your nerves and muscles, easing those anxious thoughts that keep you up at night. If your body is experiencing pain of any kind, you know that the likelihood of getting a good night’s sleep is pretty slim. Whether from a sprained ankle, sore throat, or a dull ache in your lower back, pain makes falling asleep seemingly impossible. Soaking in the hot tub can help ease pain and inflammation. For one, warm water dilates blood vessels, increasing circulation, which allows cells to get to the scene of the injury quicker and get their job done faster. One study on athletes found that water immersion therapy, including the use of hot tubs, helped aid in recovery. Additionally, water immersion reduces the force of gravity placed on joints. It supports the limbs from 360-degrees, which relieves pressure across the entire body. If your pain keeps you tossing and turning, try soaking before bed. Sitting and soaking in the hot tub for 20-30 minutes is a great way to minimize aches and pains. Just make sure you aren’t in there too long. If you begin to feel dizzy, light-headed, or feel signs of overheating, take a break from the hot tub for 15 minutes or so. Hot tubs go far beyond recreational use. They have the power to help restore precious hours of lost sleep. If you want to reap all the health benefits of your hot tub, remember to always stay hydrated before and after use. Hot tubs increase perspiration so you’ll need to replenish those fluids. Sleep is integral to our overall health and well-being. It’s important we protect it. Lisa is a freelance writer from Raleigh, NC. Having suffered from insomnia most of her life, she loves to educate on the topic of sleep health. When she isn't writing, you can find her in yoga class or working on a new recipe. It’s 11 pm and we just got out of our Bullfrog A8L. I always sleep better after a twenty minute soak. Great article. That’s fantastic. Thanks for sharing!